Please see before in driver selection sheet for needed driver for your project! 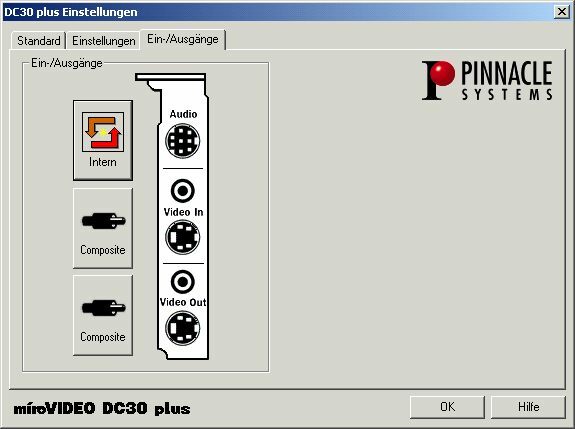 Attention: Driver 1.6 will only work with miroVideo DC30 and miroVideo DC30plus. The MAC-(Motion)-cards will only be supported from WDM-2.0-driver! The driver works also with Windows XP SP2. higher datarate (up to 7100kB/s) and miroInstant-support in Premiere. in the same way as it does in Win NT/2000. 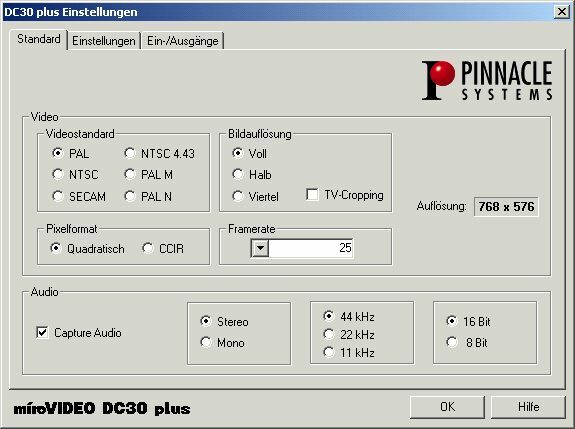 Output to tape will also work in old Mediaplayer with miro AVICache, like in NT and W2k. You can only capture in Premiere 5.x and 6.x with Premiere-Capture-Plug-In or mirocapture XP. 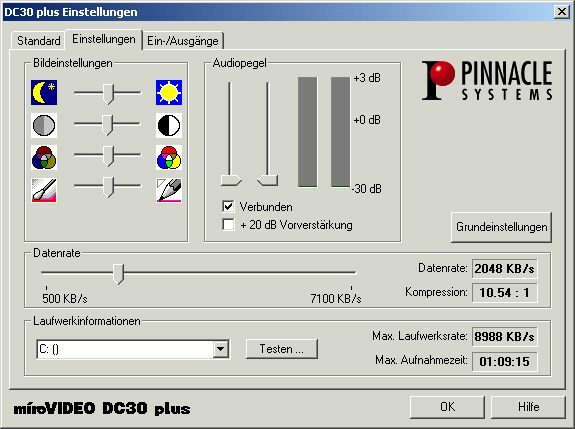 Best for Dc30 is Premiere 5.x. Other applications are not supported for capture! Capture in mirocapture XP -> edit in every video-edit application with a software-Codec. If you want use Premiere 6.x you should also install the miroInstant beta2-Update. If you use NTFS+W2k or XP there is no 2GB-capture limit. your installation language of driver 1.42 (german, english or france). Installation will be in english language. Driver 1.6 is an update for driver 1.42, which must be installed before. This are snapshoots from Premiere-Capture-Plug-In which is now included in driver 1.6. Driver 1.6 will not work if WDM 2.0-driver is installed!